Are you a chemist and over 50? Write in! I would be much more interested to read "how chemists keep their jobs past 50," but I think that getting enough anecdotes to write a story would be challenging. Are you a chemist, still a chemist, not a "boss of bosses" and over 50? I would love to publish your story. Please write in to chemjobber@gmail.com, and I would be happy to publish your story. Anonymous or not, that's up to you. The successful candidate will be an essential part of our QC/QA team providing analytical support in characterizing our dPEG® products for both catalog sales and products in clinical trials. Will support company scientists in acquiring and interpreting QC data as well as assist customers who have QC-related questions about our products. Will be a vital link in the development of the dPEG® technology. Excellent communication, problem solving, and time management skills are critical aspects of this position. So which one of you is it? ...The intense Sci-Hub activity in East Lansing reveals yet another motivation for using the site. Most of the downloads seem to be the work of a few or even just one person running a “scraping” program over the December 2015 holidays, downloading papers at superhuman speeds. I asked Elbakyan whether those download requests came from MSU's IP addresses, and she confirmed that they did. The papers are all from chemistry journals, most of them published by the American Chemical Society. So the apparent goal is to build a massive private repository of chemical literature. But why? Bill Hart-Davidson, MSU's associate dean for graduate education, suggests that the likely answer is “text-mining,” the use of computer programs to analyze large collections of documents to generate data. When I called Hart-Davidson, I suggested that the East Lansing Sci-Hub scraper might be someone from his own research team. But he laughed and said that he had no idea who it was. But he understands why the scraper goes to Sci-Hub even though MSU subscribes to the downloaded journals. For his own research on the linguistic structure of scientific discourse, Hart-Davidson obtained more than 100 years of biology papers the hard way—legally with the help of the publishers. “It took an entire year just to get permission,” says Thomas Padilla, the MSU librarian who did the negotiating. And once the hard drive full of papers arrived, it came with strict rules of use. At the end of each day of running computer programs on it from an offline computer, Padilla had to walk the resulting data across campus on a thumb drive for analysis with Hart-Davidson. All right, which one of you is downloading all of ACS' articles? Ask CJ: who are your favorite pharma/biotech analysts/writers? As a relatively new chemistry hire in Pharma, I've been looking to broaden my perspective on the industry. In a world where everyone and their pet gerbil is a SeekingAlpha writer who spews out the shallowest of hot hot takes on the latest company press releases, I would like to know which analysts you and your readers think are worth the time and clicks. I'm not just looking for industry news, I want people with strong, but thoughtful opinions: particularly those who write from a business perspective, but show a passable understanding of the science behind it. One such person who comes to mind, for instance, is Adam Feuerstein. My two answers that come off the top of my head? Matt Herper at Forbes and Lisa Jarvis at C&EN. What happens to assistant professors who go into industry? He was right about that. My friends who didn’t get that coveted promotion jumped into high-level industrial positions they could never have acquired had they started their career in that same company. You see, after six years running a lab in academia, they had project and budget management experience. They had done HR, PR, and built a valuable network of colleagues and collaborators. No age-matched bench chemist in industry could develop that portfolio of skills at the same pace. It is the last sentence that I would like to examine. Is this actually true? Far be it from me to doubt Professor Bertozzi's superior years of experience to mine own, but I find this to be a tiny bit skepticism-inducing. I suspect that it depends on the definition of "my friends" and "high-level". Also, is it really true that "no age-matched bench chemist in industry could develop that portfolio of skills?" I think there's plenty of argument to be made that industry is just as good at academia at forcing collaboration, and growing project and budget management experience. Readers, your thoughts? Is there enough anecdata out there to support this? Ask CJ: what to do when there are layoffs of rumors at your company? Readers, a question from the inbox for which I have relatively little experience: when rumors of layoffs start at your company: what should you do? A. Nothing. Plan a little, brush up your CV, that's about it. B. Work on plans for career changes, think about going back to school. Please don't take the above choices as the only one. Credit: Ma et al., Angew. Chem. Int. Ed. Thanks to Free Radical, I note a paper in Angewandte Chemie from a Chinese team  where they coated gloves with tannic acid and found that it greatly improved the ability of the gloves to catch fish. 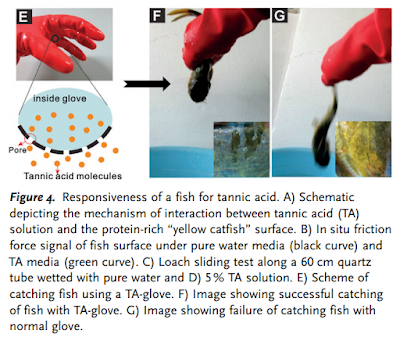 I kinda love this idea; sure, catching fish in your hands is awesome (you can really imagine a version of these gloves being sneaked into a noodling championship in Mississippi), but who knows what uses this invention will be used for? 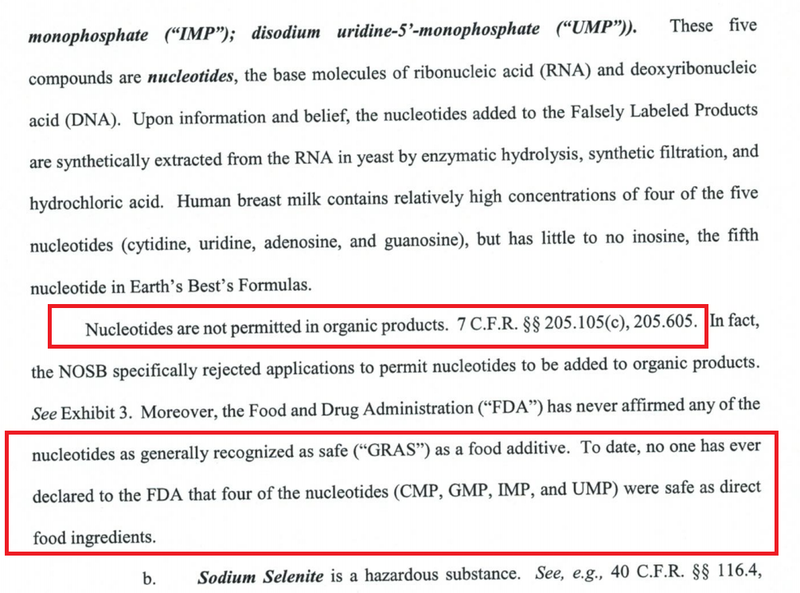 "Nucleotides are not permitted in organic products." Via Twitter user @mem_somerville, a lawsuit from the Organic Consumers Association against two formula manufacturers. If you'd like to read some high-test chemophobia, these lawsuits (PDFs) are a great place to start. We have an opening for a joint position in the labs of Professor Michael White (Department of Global Health) and Professor Jim Leahy (Department of Chemistry) at the University of South Florida. This is a post-doctoral position to join a drug discovery project focused on identifying new treatments for malaria. The successful applicant will establish new methodology for assaying kinases that are difficult to express and develop protocols using the new assays to screen small compound libraries. Candidates with biochemical experience are preferred. Interested candidates should contact Jim Leahy (jwleahy@usf.edu). A postdoctoral position is immediately available in the laboratory of Daniel Appella, Senior Investigator in the Intramural Research Program at NIDDK, NIH. The objective of our research is to use chemically designed Peptide Nucleic Acids (PNAs) to uncover novel facets of biology (for background, see: Nature Communications, 2014, 5, 5079 and J. Am. Chem. Soc. 2014, 136, 12296). In this position, training will be provided on synthetic preparation and purification of PNA as well as the application of PNA to multivalent scaffolds and RNA detection. Candidates must have a Ph.D. in Organic Chemistry (or a closely related discipline) and possess a strong desire to work at the interface of chemistry and biology. Interested candidates should send a C.V. (listing three references) and cover letter to Daniel Appella (appellad@niddk.nih.gov) no later than June 1, 2016. ...Sos was presented with an opportunity to become an international director at 3M, overseeing the company’s businesses in Asia. But the position required that he relocate to Shanghai. It seems to me that "go overseas for a short while" is a pretty standard way of getting a promotion in a large multinational company. Don't miss the other ones; they're all worth your time. How do the ACS employment surveys work? Rick Ewing is the chair of ACS' Committee on Economic and Professional Affairs. The committee is in charge of the 3 core ACS employment surveys, the ACS Salary Survey, the ChemCensus and the New Graduate Survey. In this week's C&EN, he writes about the surveys and their methodology. While I understand that this is a problem of resources (we can't send people to ACS members' houses, knocking on their door and asking them to fill out the ChemCensus), I am a little bit concerned that CEPA apparently does not have a plan or an answer to the response rate problem. If the response rate continues to fall, at what point does the data from the ChemCensus or the annual Salary Survey become less valuable? What others plans does CEPA have to raise the response rate? (I have gotten physical postcards, reminding me to fill out my Survey (and I do!)) What distinguishes respondents from those who do not respond? I am sure that CEPA is looking at these questions, and I look forward to the answers. Andrea Widener covers Cherry Murray, the director of the Department of Energy's Office of Science. The comment about "star students" in MIT's physics department going to Bell Labs is fascinating; I wonder where they go now? I sure hope the answer isn't "Wall Street." Lots of comments at Jyllian Kemsley's latest article about the University of Hawaii flammable gas explosion. I am really stumped about the case for Wacker's polysilicon plant in Tennessee. The people interviewed by Michael McCoy are, too, it seems. Fair number of comments about virtual reality and chemistry. Interesting comment that "I can already see my molecules." Fair enough, but perhaps the point of virtual reality may be to show you where your chemical intuition is wrong? The View from Your Hood: "Above the trees"
Pictures of wrecked labs are always sobering, but the latest photographs obtained from the Honolulu Fire Department by C&EN from the University of Hawaii incident are pretty awful. The last photo is the worst. You've been warned. Flammable gases are no joke. "No one [cares] if you know how to use Microsoft Office." We have no retirement savings, because we emptied a small 401(k) to pay for our younger daughter’s wedding. Assuming this is true and there is no other context to this statement, this appears to me to be a profound error in judgment. Don't let this happen to you, dear reader. Emptying out your 401(k) for a party (no matter how important the party) is not a wise decision. Apropos of nothing, a video of 6 bulldozers fighting in China. (Context here.) You figure this is what the streets of Brooklyn were like in 1910 or so. UPDATE: Are you a young woman in China? Watch out for your foreign spy boyfriends! A QC analyst injected eleven identically or similarly named samples for impurity and assay analysis approximately one to fifteen seconds apart from one another, according to the HPLC audit trail for [redacted] DMF submission batches [redacted] and [redacted]. A second analyst injected eight similarly named impurity and assay samples approximately twelve to sixteen seconds apart, according to the HPLC audit trail for the analysis of [redacted] batches [redacted] and [redacted]. Neither analyst reported all results obtained during testing. The laboratory incident reports concluded the first analyst deleted 28 original files due to pressure fluctuations and ghost peaks, while the second analyst deleted original trial injections of working standard and sample testing data due to a problem associated with peak shape. However, your laboratory incident reports provide no evidence to support these conclusions. Both analysts also changed the clock prior to reanalyzing the samples. b. A QC analyst injected sample P140818008.lcd for the assay analysis of [redacted] (batch [redacted]) prior to the reported sample injections. The “trails” [sic] folder where the original sample injection file was saved had been deleted. 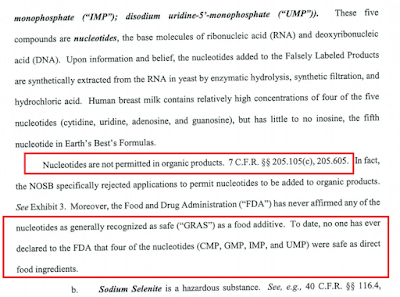 Your response acknowledges that an analyst deleted eight injections, including the blank, six standards, and a sample. c. A QC analyst deleted original test method validation data and admitted plans to fabricate sample preparation data. According to the HPLC audit trail, on October 7 and 8, the QC analyst injected two sets of similarly named samples of (b)(4) (#1:P141007001.lcd and #1:P 141007001.lcd) for an impurity analysis method validation study. Your analyst deleted data from the first set of injections and submitted only the second set in the validation documentation. The analyst stated that he planned to back-date the preparation data within the worksheets once all testing was complete. However, aside from balance scale tickets, your firm was unable to provide sample preparation data for either sample. Your response states that you abandoned the method validation study, but you continue to use that method for routine testing. In response to this letter, provide the method validation study that supports your current method for analyzing impurities in [redacted]. So what the heck is the point in injecting sample after sample into a HPLC within seconds of each other? I don't get it. Accidental causes were considered and only one probable cause remained. The accidental cause of this explosion was caused by the detonation of compressed gasses to include: Hydrogen, Carbon Dioxide, and Oxygen within the air tank. A digital pressure gauge used to check the pressure within the tank was not rated or designed (not Intrinsically Safe) to be in a flammable gaseous atmosphere. When the OFF button was pressed, an electrical arc/spark created within the gauge detonated the flammable gas within the tank causing the explosion. Level of Certainty: Probable, with a reasonable degree of fire investigative certainty. On this particular day, she moved and filled the tank with a set amount of gasses using the Ashcroft 300 psi digital gauge that is battery operated. This gauge is a push button type for ON and OFF. When she disconnected the hoses used to fill the tank, she checked the pressure in the tank to verify the amount to be 117 psi. She then pressed the OFF button and the tank exploded. Prior to the explosion, she did not hear any sounds of escaping or leaking gasses from any of the fittings or pressure relief valve. She did not lose consciousness or hit her head; she was aware that she lost her arm in the explosion. She couldn’t open the door to the lab, the door was stuck closed. A person by the name of Savannah was there to help get the door open and help her out of the lab. She added that earlier in the week, she was conducting another experiment using a smaller one gallon size air tank assembly nearly as identical as the one that failed using similar components to include the Ashcroft 100 digital pressure gauge and the premixed gasses. The tank pressure was set to 27 psi. After reading the gauge, she pressed the OFF button and a small internal explosion occurred. She related to me that there was evidence of a soot and smoke stains. Static shock also appeared to have been a problem as Ms. Ekins-Coward would get shocked on occasion when touching the tank. She brought this information to the attention of Mr. Yu who she said told her don’t worry about it. What immediately bothers me about this incident is that I have been simplistically trained to think about the "fire triangle": that oxygen, fuel and a heat source are needed for a fire. In this case, because the Yu Laboratory and Dr. Ekins-Coward were running mixtures of hydrogen, oxygen, you have both fuel and oxygen, so most of the preventative measures should have been aimed at reducing the risk of a spark. That there were near-misses is supremely tragic - this didn't have to happen. The victim Thea Ekins-Coward was working as a Post-Doctoral Fellow trained in Marine Science and a Chemical Engineer. She was hired by Dr. Yu October 2015 to conduct research in bioplastics and biofuels. The tank that failed was Ms. Ekins-Coward's design. She bought the equipment (tank, digital gauge, pressure relieve valve, and fittings) between November 2015 and January 2016. The tank was to have been rated at 10 bar or 150 psi. When the tank was assembled with its parts, a pressure test was done using the buildings air which produced 91.2 psi. Several leaks were detected. So the tank assembly was taken to the Universities maintenance for help in stopping the leaks. This particular tank was used to contain a mixture of gases to include: 70% Hydrogen, 10% Carbon dioxide, and 20% Oxygen in that order and to a normal operating pressure of 50 psi. The tank was not grounded and was normally moved from a stored location to areas where it could be filled. The tank would be moved approximately 3 feet to fill it with Hydrogen and Carbon Dioxide, then moved approximately 13' so it can be filled with Oxygen. The air tank and assembly that failed was purchased between November 2015 and January 2016. 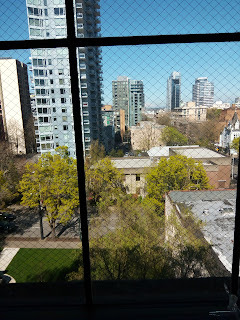 The parts were assembled and pressure tested with the building supplied air. This output of air was 91.2 psi which was sufficient enough to cause leaks at the connections so the tank assembly was taken to the Universities maintenance shop where they helped stop the leaks. The design of this tank assembly was that of Dr. Jian Yu. The tank was rated at 145 psi. Who designed the tank and selected the pressure gauge? Is it accurate that both the PI and postdoc were trained as chemical engineers, as brief Google searching seems to indicate? What is the role of the institution and its EH&S office in this? Did the EH&S office know about the Yu Laboratory's experimental systems? This was clearly an unsafe experimental setup - will the comments about this experiment being safely performed since 2008 be walked back? What disciplinary actions are going to be carried out by the department or institution? Will there be civil penalties from the state occupational health and safety regulatory agency or from the local fire authorities? Will there be criminal penalties? The current lesson to be learned: when dealing with flammable gas mixtures, inherently safe equipment will go far to prevent fires, explosions and serious injury. The gas mixture was “food” for bacteria being used to produce biofuels and bioplastics. Ekins-Coward was working for the Hawaii Natural Energy Institute under researcher Jian Yu. A 2013 paper by Yu indicates a set-up in which gases are plumbed through a mixing device called a gas proportioner directly into the bioreactor (Int. J. Hydrogen Energy 2013, DOI: 10.1016/j.ijhydene.2013.04.153). The gas gauge identified in the paper is an “intrinsically safe” model designed to prevent ignition. But after Ekins-Coward started in the lab last fall, she purchased a 49-L steel gas tank, a different gauge not rated as intrinsically safe, a pressure-relief valve, and fittings, and she put them together, Yu and Ekins-Coward told fire department investigators, according to the report. Ekins-Coward would add the gases to the portable tank, which would then be connected to the bioreactor. She was using a mixture of 70% hydrogen, 25% oxygen, and 5% carbon dioxide for her experiments, the report says. In the week before the incident, a similar set-up with a 3.8-L tank resulted in a “small internal explosion” when Ekins-Coward pressed the off button on the gauge, the fire department report says. Also, she links to a longer version of the report. “Overwhelmed by Orgo” (C&EN, March 28, page 24) on the crisis in organic chemistry education struck a chord. As an organic chemistry instructor at the university level for more than 20 years, I can attest to a noticeably diminished student capacity to handle the subject with each passing semester. It should be emphasized, however, that organic chemistry is not and was never intended to be an easy discipline to master. Hand-wringing over new teaching techniques or providing yet another clone of the texts is an exercise in futility. Jazzing up texts with pictures and graphics does little more than inflate already obscene prices. My suggestions to include at least a rudimentary introduction to organic chemistry in the preparatory general chemistry curricula have been met universally with stiff resistance. As a result, students are thrown into the deep end with no swimming lessons. But the core problem is endemic to science education in general. Students go unchallenged through their first 12 years of formal education, rewarded exclusively by rote memorization with no opportunity to develop skills in critical thinking and problem solving by analogy, essential elements of organic chemistry. Disturbingly, many of those considered successful at the university level are so only because rote memorization is now embraced by their professors as well. In C&EN’s article, Melanie Cooper, a chemistry education professor at Michigan State University, states, “Students come out of general chemistry typically very unprepared.” Worse, I’ve found, they graduate college very unprepared. I routinely give a 12-question chemistry quiz to interviewees/applicants looking for employment as a bench chemist. I have found that they and even some recent hires are poorly prepared for jobs in chemistry. For instance, they cannot explain the difference between a weak acid and a dilute acid or the difference between an end point and an equivalence point. One interviewee, prior to taking my short chemistry quiz, told me he tutored chemistry, but he only got 6.5 correct answers out of 12. And a recent graduate with a B.A. in chemistry whom I had hired, and who has thankfully left, didn’t know that mercury was a liquid. Who lets these people graduate high school or college? Educators should be held liable for poorly educating students. Some teachers are “teaching-disabled.” If you really want to improve the quality of chemistry students going into the working world, put pressure on the secondary schools and colleges to stop graduating those who simply put in four years. The education and work ethic are not there. Regarding the first letter, I actually deeply agree that organic chemistry is just a difficult subject, and there's not a lot that people can do to change that fact. I am not sure what my "intelligence-essential facts" are, but I am sure that I have them. It'd be interesting to get a copy of Dr. Schreiber's 12-question quiz to see what he considers important. Cover story: Britt Erickson covers the use of silicone wristbands to track exposure of the general public to various chemicals of concern. What is the relationship between "it absorbed onto this silicone wristband" and "it made it into my bloodstream?" I learned a lot about the "bowtie method" of communicating risk and hazard assessment in Jyllian Kemsley's article. Will be interesting to see if any of these moves will change the trajectory of honeybee populations in the US. As mentioned in the comments, Jyllian has the identities of the CLS investigators who will be looking at the Hawaii incident where a postdoctoral research lost her arm in an explosion. Quintus talks about the latest from the crystalline sponge world. Glad to see ACS is working on videos about What Chemists Do. Stellen fuer Chemiker, still working on German chemistry jobs. The latest Chemical Dependence podcast from Chad. @Organometallica, now working for Nature Chemistry. Fascinating/scary post by Curious Wavefunction on synthesis algos. I love, love, love this post by Mitch about NMR and the X-Files. Old guy observation: I actually watched this episode that Sunday (?) night, and I just about jumped out of my seat when I saw that NMR. Also, the molecule is too damn small for that spectra. I thought this was a really smart post about style by Cloud. "Blue shirt/khakis pants can't work for everyone" is a lesson I have yet to learn. More good stuff from Slava Bernat. Haven't had a chance to read CSB's report about Macondo, but I am looking forward to it. ...What is the role of the medicinal chemist in the development of precision medicine and how can younger generations prepare to make contributions in this area of research and development? ...The adjective “medicinal” already alludes to the complexity of the work and, consequently, the demands on a medicinal chemist. He or she must understand biology, must be a data scientist, must be familiar with the full spectrum of assays and analyses that inform his or her design work. A medicinal chemist must remain up to date on developments, always look for new potential targets, new applications for a candidate drug and new ways of designing molecules to meet often contradictory requirements. Looking into the future, as more discovery and optimization work is conducted at smaller biotech companies, the medicinal chemist will also be expected to control development costs, to seek new resources, and to interact collaboratively with a growing number of stakeholders that can inform his or her work. Though perhaps a daunting prospect, this increased responsibility will be accompanied by a greater and more direct impact of his or her work on the well-being of patients. For a future career in medicinal chemistry, nothing can replace knowledge acquired through experience. Academic training is only the beginning of the medicinal chemist’s preparation. He or she must continue to learn from the work of designing and optimizing a compound, from the often overwhelming information that he or she must integrate, and from the people with whom he or she interacts. Important to remember is that this chosen profession is at times very frustrating, but also has moments where you advance in solving a problem and that satisfaction is unmatchable. Be always flexible and creative, and strive to do something different. One thing that Dr. Cui mentions here is the centrality of the medicinal chemist in a drug discovery project. Derek Lowe mentions this every once in a while when he says that "You are in real trouble if someone knows more about your project than you do." I think about that a lot. I know it may disappoint some administrators to hear that the best thing a university can do to encourage startups is to be a great university. It's like telling people who want to lose weight that the way to do it is to eat less. But if you want to know where startups come from, look at the empirical evidence. Look at the histories of the most successful startups, and you'll find they grow organically out of a couple of founders building something that starts as an interesting side project. Universities are great at bringing together founders, but beyond that the best thing they can do is get out of the way. For example, by not claiming ownership of "intellectual property" that students and faculty develop, and by having liberal rules about deferred admission and leaves of absence. In fact, one of the most effective things a university could do to encourage startups is an elaborate form of getting out of the way invented by Harvard. Harvard used to have exams for the fall semester after Christmas. At the beginning of January they had something called "Reading Period" when you were supposed to be studying for exams. And Microsoft and Facebook have something in common that few people realize: they were both started during Reading Period. It's the perfect situaton for producing the sort of side projects that turn into startups. The students are all on campus, but they don't have to do anything because they're supposed to be studying for exams. ...But if a university really wanted to help its students start startups, the empirical evidence, weighted by market cap, suggests the best thing they can do is literally nothing. I gotta say, I don't know much about startups, but I'm pretty sure that "try to be a better university" and "do nothing and let stuff happen" is pretty good advice. 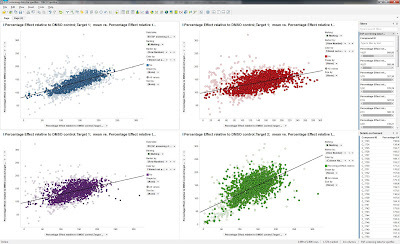 How do you use data sorting tools? As a medchemist I lived and breathed SAR. And, working with Spotfire, I still kind of do as that tool is often used to allow quick comparison of many properties and make SAR much easier than looking at Excel tables. My question is this.... how many other industries use similar methodologies? I talked to a major unnamed oil and gas company once, but their homogeneous catalysis unit (metallocenes) and they were doing essentially SAR on their catalysts - albeit with different properties than the cLogP and #RotationalBonds that a medchemist is used to. I'd be fascinated to learn what other non medchem chemists use similar techniques - be it battery development, paints, stuff to keep mollusks from growing on your boats or maybe process chemistry. What tools do people use (Excel, Spotfire, JMP?). And what properties do they use in lieu of the traditional cLogP etc. I think in process development, there are a variety of data tracking tools (and various Design of Experiments software packages.) I think I'm still a fan of Excel, but I am probably stuck in the Dark Ages. I think most research-intensive organizations do some sort of multi-parameter optimization, but I dunno what kind of parameters they have, and how they keep track of all the data. Readers? Quite the photograph in the chapter about UVM (to left); that hood took a real beating. The reason the hood caught fire is not made clear. 1. 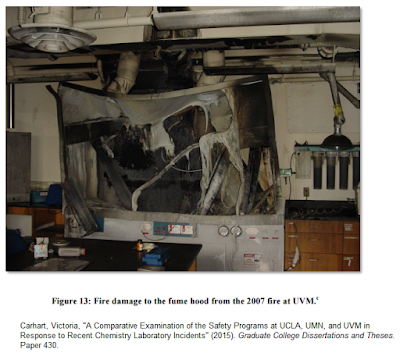 Carhart, Victoria, "A Comparative Examination of the Safety Programs at UCLA, UMN, and UVM in Response to Recent Chemistry Laboratory Incidents" (2015). Graduate College Dissertations and Theses. Paper 430. The University of Hawaiʻi at Mānoa has retained the University of California (UC) Center for Laboratory Safety to conduct an independent investigation to determine the cause of the explosion in a Hawaiʻi Natural Energy Institute biofuels research laboratory in the UH Mānoa Pacific Ocean Science and Technology building on March 16, 2016. A visiting researcher seriously injured in the accident has been released from the hospital. “The entire Mānoa community is keeping her in our thoughts and prayers for a speedy recovery,” said UH Mānoa Chancellor Robert Bley-Vroman in a message released to UH Mānoa community on April 4, 2016. The UC Center for Laboratory Safety is considered a national leader in laboratory safety in developing evidence-based best practices and facilitating implementation and optimization of laboratory safety practices. The UC Laboratory Safety Team was on the Mānoa campus the week of March 28 and the investigation is expected to be complete by the end of April. “All preliminary indications are that the accident was an isolated incident and not the result of a systemic problem at Mānoa or intentional wrongdoing,” said Bley-Vroman. As I said on Twitter, analogies are terrible, but this is like a college football team hiring NFL investigators to tell them how to avoid concussions. It also frustrates me how often organizations (all organizations) will get out in front of these incidents by swearing up and down that it was an "isolated incident", and that it's most certainly not systemic. (Don't forget "tragic accident.") In these situations, I think "it happened, we are sorry, and we are investigating" is all I want to hear until there is a full report to be given. It's cold comfort that Dr. Ekins-Coward is receiving workers' compensation benefits. I am responding to Nelson Marans’s letter “Skimming the Classifieds” in the Feb. 22 issue (page 2). Maran wonders why the listed academic positions post requirements that the applicant would “have to walk on water” to qualify for. I have been under the conception that (and please tell me if I am misinformed) the applicant has already been picked for this position and that they are fulfilling requirements to advertise the position before a selection is made. Therefore, another applicant would be exceedingly difficult to find. I also have my own question about the job openings. Industrial position listings have almost disappeared. Why? I would like to add a counterpoint to Nelson Marans’s advice to recent Ph.D.s to seek a job in industry or government rather than in academia. I worked in industry before moving to academia, and there are signal advantages to the latter: the freedom to work on whatever science excites you, the opportunity to inspire young people to pursue chemistry, the soothing rhythm and flexibility of the fall-spring-summer academic schedule with its regular breaks and changes of pace, not having to worry about “fifty and fired” (as an industrial colleague of mine put it), the satisfaction of teaching chemistry well to brand-new science majors, and the gratification of seeing former students thrive and succeed in their careers. "Fifty and fired" makes me more nervous every day. Less than a $100/kg now? Huh, that sounds kinda cheap. Lisa Jarvis covers the purchase of Nimbus's liver disease portfolio by Gilead. Has anyone looked at whether or not these candidates are getting bigger (molecular weight-wise) over time? Fascinating article by Mitch Jacoby about the detection of TATP. Great idea for a ACS San Diego session (and a very interesting article by Stu Borman): chemists who should have won the Nobel, but didn't. NEW YORK, NY - The breakup of Pfizer and Allergan, which occurred publicly on April 4, left thousands of employees and competitors gleefully amused. Pfizer and Allergan met two years ago on Wall Street, where they embarked on their ill-fated affair with a drunken kiss in a Manhattan parking garage, ending six-month dry spells in mergers and acquisitions for each of them. Jack Lew, a mutual friend of the couple, was one of several witnesses to the abrupt and hostile public disintegration of Pfizer and Allergan’s torrid-but-strained romantic entanglement. “After they made a scene and spilled their drinks,” Lew continued, “the last thing she said before she stomped out was that she didn’t want to move all her stuff to Ireland anyway. The whole incident would have been uncomfortable if it hadn’t been so funny. We all suspected their relationship was based more on shared interests in financial shenanigans and tax avoidance than on love." Allergan was said to have stayed at the bar and ordered another drink. Rumors abound that Allergan has been cavorting with several other partners, including U.K. resident Heptares, behind Pfizer’s back. Hours after his breakup with Pfizer, Allergan and Heptares were seen making out in in a restaurant in Welwyn Garden City. "So, I don’t have a picture, but I have a memory from [redacted] years ago. The floor-to-ceiling windows of Pfizer’s Chem Eng lab in Groton, CT look out on the mouth of the Thames River. The Northrop Grumman shipyard is just a mile or so up river and the Naval Submarine Base New London is another couple of miles. Every few days you could watch a nuclear sub going out or coming back from a patrol. Silent black shape with a few sailors standing on deck." Dharmesh’s culture code incorporates elements of HubSpeak. For example, it instructs that when someone quits or gets fired, the event will be referred to as “graduation.” In my first month at HubSpot I’ve witnessed several graduations, just in the marketing department. We’ll get an email from Cranium saying, “Team, just letting you know that Derek has graduated from HubSpot, and we’re excited to see how he uses his superpowers in his next big adventure!” Only then do you notice that Derek is gone, that his desk has been cleared out. Somehow Derek’s boss will have arranged his disappearance without anyone knowing about it. People just go up in smoke, like Spinal Tap drummers. I have heard of people who have left a company as "alumni", but this is taking it a step further. Every company has its jargon, but I think folks should be cautious when an organization's internal language tends to obscure unpleasant things. I've never heard any euphemisms during an interview, but if I did, it would instantly put me on guard. Readers, what's your favorite corporate euphemism? What's it like to work at AMPAC Fine Chemicals? Does anyone know what it is like to work at AMPAC Fine Chemicals in Sacramento? Pay, benefits, etc? For the last 5 years, they've put out routine positions for entry-level process chemists. My understanding is that they are a pretty solid CMO, with routine FDA inspections, GMP suites and the like. Anyone have any experience they'd like to share? UPDATE: I should note that Glassdoor salaries for AMPAC Fine Chemicals are not exactly fabulous. South San Francisco, CA: Not every day that you see an industrial chemical biology position, but here it is at Genentech. Los Angeles, CA: Surface chemistry R&D position in Los Angeles; Ph.D. desired. 75-90k - hmmmm. Torrance, CA: Dentistry-oriented 3D printing company is looking for a polymer chemist; pay offered is 50-65k. Wow, that's......... bad. Baytown, TX: ExxonMobil looking for a Ph.D. analytical chemist. Chandler, AZ: New health-oriented startup HealthTell, Inc. is looking for an analytical biochemist and a director of chemistry. Wilmington, DE: And all the way on the other side of the country, a Field Service Engineer position with Agilent. Now *that's* a different one! POSITION DESCRIPTION Barbaricum seeks a Chemist Support SME to support an advanced EOD course of instruction specifically designed to train EOD operators assigned to support SOF Regional Commanders. This PWS focuses on curriculum, operational training, and practical exercises to better prepare EOD personnel to support SOF missions. This program is meant to train EOD Technicians prior to their evaluation period within the SOF EOD Fleet Readiness Training Plan (FRTP). The evaluation is conducted by the appropriate EOD Group Training and Evaluation Unit (TEU). This contracted training event is to provide post-military, experience-based Improvised Explosive Device (IED) diagnostics and Category A training to United States Navy (USN) EOD Technicians in support of Counter Terrorism (CT) Direct Action (DA) mission forces deployed throughout all regions of the world. Bonus military nerd headscratching: So I'm sure the US Navy has their own EOD (Explosive Ordinance Disposal) technicians. But who are the "Counter Terrorism (CT) Direct Action (DA) mission forces"? I think my understanding of elite special forces units is pretty decent, but is about a decade out of date.... I guess what I am really saying is that I feel that "Direct Action (DA)" is a new-ish term for the US military to be using in its self-descriptions. From the inbox, a minor oopsie. The Department of Chemistry and Biochemistry has an opening for a Teaching Assistant Professor. The successful candidate will teach 2 undergraduate courses and accompanying lab sections per quarter with a total of 6 courses per year. Typical sizes of lecture courses are 80 to 90 students. Teaching opportunities include classes for non-science majors, general chemistry, and organic chemistry, depending on candidate background and Departmental needs. Responsibilities for laboratory sections will include supervision of undergraduate and graduate teaching assistants. The position is non-tenure-track, and is renewable annually, based on performance evaluations. The start date is September 1, 2016. Mayagüez, Puerto Rico: The University of Puerto Rico at Mayagüez is looking for an assistant professor of biochemistry or biophysical chemistry. Interestingly, this is a position for August 2016. "Starting at 62,256.00" - I suspect that's not bad for Puerto Rico. 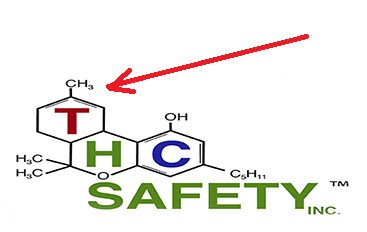 Minneapolis, MN: The Center for Drug Discovery at the University of Minnesota is looking for synthetic medicinal chemistry postdocs; 38-40k offered. St. Paul, MN: "Ranked faculty" position at St. Catherine's University; appears to be non-tenure track. ...Later this year, Webster said, prices will likely dip once more below $30, a level low enough to shake some high-cost producers, largely in the U.S., out of the market. Prices will climb once that bottom is reached to average about $44 this year. Webster sees prices inching up higher in 2017. Despite harrowing signs such as low oil prices, meager stock market performance, and deep recessions in Russia and Brazil, IHS Chief Economist Nariman Behravesh put the probability of a global recession at 25%—and one in the U.S. at a mere 20%. Strong consumer spending is bolstering the U.S. economy, offsetting poor performance in manufacturing. Behravesh also observes strength in Europe and Japan. I still don't think there will be a "technical" recession bagel (e.g. negative growth for 2 quarters in a row) in 2016 or 2017, but there might be data to support predictions that there will be one. Readers? Did you notice the British American Tobacco advertising supplement? I was disgusted to find the 14-page “special promotional supplement” from British American Tobacco (BAT) in the March 14 issue of C&EN. Regardless of the advertising revenue this may have generated, that is insufficient justification for the American Chemical Society to help big tobacco look respectable. Audrey Richter, wrote that BAT aims to “contribute to the development of global voluntary and regulatory product standards for e-cigarettes.” Translation: BAT will fight for the least restrictive universal regulation so that it is free to broadly market its products globally. To its everlasting shame, the American Medical Association published tobacco advertisements in the Journal of the American Medical Association for 20 years despite known risks, lending respectability to a killer. It would be a shame if ACS through C&EN does the same. Kevin Davies, C&EN’s publisher, responds: The promotional supplement sponsored by British American Tobacco was excerpted from the company’s “Science & Technology 2015” report. A condition of accepting the advertising was that the promotional supplement focus on BAT’s R&D and quality-control efforts, as well as spotlight career opportunities for chemists within the organization. C&EN does not endorse e-cigarettes or tobacco products of any kind. I have to say, I was surprised to see the British American Tobacco supplement in the magazine. Ya gotta pay the bills somehow, and I hope there was a pretty penny paid by BAT for this opportunity to annoy influence educate C&EN readers. Here's the thing that I have to ask BAT, though - does anyone actually read special advertising supplements? I could barely make it through a page or two of the thing, and I have more of an interest in reading every word of the magazine than most. Jessica Morrison on chemists and virtual reality. Stu Borman covers the mini drug factory from the Jamison group. Looks like Thermo Fisher has achieved success in its bid to buy Affymetrix. Britt Erickson covers Congress' look into the Syngenta/ChemChina merger. Will be important to see if Chinese companies are ultimately stymied in their goal to own US agrochemical firms, kind of like their attempt to purchase a piece the systemically important US pork market. Donna Nelson asks about ubiquitous chemistry. December 9 to 12, 2016, Orlando, Florida, U.S.A. Welcome to the sunshine of Orlando, Florida for the CJ WCCCVP 2016, a flagship international conference sponsored by the Chemjobber Institute of Chemical Employment Study promoting all aspects of CV padding (CVp). The CJ WCCCVP 2016 co-locates multiple exciting symposiums at one single location, providing a unique opportunity to encourage cross-fertilization and collaborations in all areas of CV padding. The CJ WCCCVP 2016 features a large number of keynotes, tutorials in padding your CV, and special sessions in all manner of CV padding. The CJ WCCCVP 2016 will also offer a number of travel grants as well as an exciting Predoctoral Consortium, a ABD Consortium, Doctoral Consortium, a Postdoctoral Consortium and a Postpostpostpostdoctoral Consortium. YOU are an invited plenary speaker. YOU are on the organizing committee. YOU are the chair of your own invited symposium. YOU are a keynote speaker. We hope you could participate in this exciting event, and look forward to joining you in padding CVs in Orlando in December 2016!